The Visual Trading Console & multi-terminal trade manager software for the Metatrader platforms has been developed with intraday traders in mind. When designing the interface, we’ve focused on ease of use and ergonomics alongside such important factors as speed and dependability. These can be seen when looking at the handy bottom toolbar and flexible order grids. The Visual Trading Console (Multi-Terminal version) features a context-sensitive toolbar (3), which adapts to the currently viewed “Market Orders” (1) or “Pending Orders” (2) tab. This button functions as a display for the floating P/L value, for all or only a selected account number. Additionally, when pressed, the button functions as a “close all” command, which is capable of quickly closing out trades across all monitored Metatrader accounts or only the selected account number. The function handles all requote and busy errors, so closing all orders is really a quick and easy process. The “Exit all” button features a split button component (arrowhead pointing down on the right side of the button). When the arrowhead icon is clicked a drop-down menu is displayed, showing a list of all monitored account numbers and the “All accounts” entry. This list is used to select the account number to monitor on the P/L display and to perform the “Exit all” function on. When “All accounts” is selected, the P/L display will show the floating P/L for all monitored accounts and when the button is pressed, all trades will be closed across all monitored accounts. This button functions as a display for the floating P/L value, for selected ticket numbers. Additionally, when pressed, the button functions as a “close selected” command, which is capable of quickly closing out selected trades across all monitored Metatrader accounts. The function also handles all requote and busy errors, so closing all orders is really a quick and easy process. Ticket selection is done via checkboxes which are located on the leftmost column in the “Market Orders” tab. You can also use the split button (arrowhead on the right side of the button) to quickly select or unselect all visible tickets via the drop-down menu. These two switches are used to toggle the floating P/L display (on the corresponding “all [P/L]” or “selected [P/L]” buttons) between pip values and currency values. When the switch is in the ON state, the corresponding value is displayed in pips. This switch is used to toggle the P/L display on the “Market Orders” grid (the “Close [P/L]” column) between pip values and currency values. When the switch is in the ON state, the P/L values are displayed in pips. This button is used to quickly delete pending orders across all monitored Metatrader accounts or only the selected account number. The “Delete all” button features a split button component (arrowhead pointing down on the right side of the button). When the arrowhead icon is clicked a drop-down menu is displayed, showing a list of all monitored account numbers and the “All accounts” entry. This list is used to select the account number to perform the “Delete all” function on. When “All accounts” is selected and the button is pressed, all pending order will be deleted across all monitored accounts. 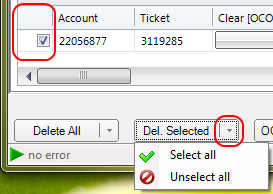 This button functions as a “delete selected” command, which is capable of quickly deleting selected pending orders across all monitored Metatrader accounts. Ticket selection is done via checkboxes which are located on the leftmost column in the “Pending Orders” tab. You can also use the split button (arrowhead on the right side of the button) to quickly select or unselect all visible tickets via drop down menu. This button is used to perform the OCO function on selected pending orders. 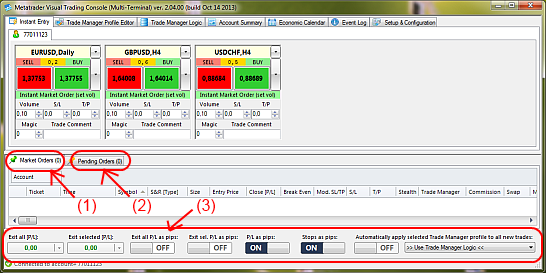 This switch is used to toggle the display of S/L & T/P values on the order grids between pip values and currency values. When the switch is in the ON state, the S/L and T/P values are displayed in pips. This function will automatically apply the selected trade manager profile to ALL NEW trades initiated via VTC or directly from Metatrader (manually or via EA). The action is performed using the ON/OFF switch along with the drop down menu located to the right of the switch. Once you no longer wish to have this function active, simply switch to the OFF state. For safety reasons, this function will automatically be deactivated when the console is restarted. is it possible to auto-apply only to new trades carrying specific magic numbers? would you add a function , such as group orders trailing stops? when a trade is managed by VTC, does it change the magic number of the trade after a partial close? No, the magic number is not altered once it is set. Metatrader takes care of this by design. Does the system allow you to specify a percentage of your account to trade? Rather then needing to enter a lot size? Yes, please see the following page for more info on setting up orders with risk based volume calculation.